1. Istanbul University, Faculty of Dentistry, Department of Oral Surgery, Istanbul, TURKEY. 2. Istanbul University, Faculty of Dentistry, Department of Orthodonthics, Istanbul, TURKEY. 3. Istanbul University, Medicine Faculty, Department of Oral Pathology, Istanbul, TURKEY. 4. Istanbul University, Faculty of Dentistry, Department of Oral Surgery, Istanbul, TURKEY. Gardner's Syndrome is a variant of familial adenomatosis polyposis (FAP) with a triad consisting of polyps of the colon, multiple osteomas and surface tumors of soft and hard tissue. The intestinal polyps have a %100 risk of undergoing malignant transformation, therefore early identification of this disease is very important. There are several symptoms of Gardner's syndrome in the oral and maxillofacial surgery, which can be discovered during routine dental examination. We report a case of a 25-year old male patient with Gardner's syndrome who has not any intestinal polyps but osteomas in the mandible and jaw deformalities. Oral and facial anomalies are commonly observed in patients affected with this disease complex, and intestinal polyps predominantly cause malignancy. Dentists should be aware that oral and facial anomalies may play an important role in the early diagnosis of GS. This article presents a case of GS and briefly reviews the oral and maxillofacial considerations of this disease. 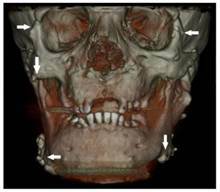 A 21-year-old patient was referred to the Department of Oral Surgery at Istanbul University, Istanbul, Turkey, for the management of craniofacial manifestations of GS. Intra-oral, extra-oral, and radiological examinations were performed. The patient came to our attention due to a primarily esthetic complaint about the right angle of the mandible. An initial clinical examination showed a nodular formation that was palpable along the mesial portion of the right mandibular angle (Figure 1). 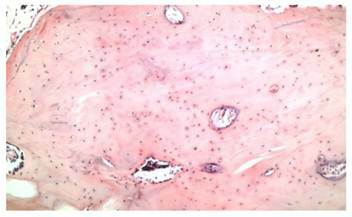 The oral mucosa was normal, and the regional lymph nodules were not palpable. A panoramic radiograph and an anteroposterior radiography showed the presence of multiple round radiopaque lesions in both the maxilla and mandible, multiple impacted teeth (upper right first, second premolar, upper right third molar, upper left canine, upper left first and second premolar, upper third molar, lower left canine, first and second premolar, and lower right canine, first and second premolar), and multiple odontomas, each measuring approximately 0.5 to 2 cm in diameter (Figure 2). On palpation, these lesions were hard, well limited, and non-adherent to the skin. Diffuse sclerosis could also be noted throughout the mandibular body. Neither crepitating nor clicking on mouth opening was noticed in the temporomandibular region bilaterally. Maximum mouth opening was not restricted (42 mm). No deviation of the mandible was observed, and no pain on mouth opening was evident. 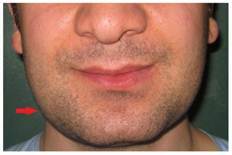 No trigeminal paresthesia was diagnosed, and the facial nerve function was preserved. Front view of the patient's lower face. Panoramic view of the patient presenting multiple osteomas. A particularly large lobulated osteoma is present in the right condyle and coronoid process that impacted both permanent and deciduous teeth. 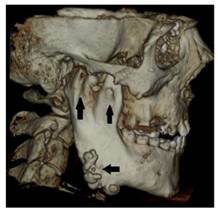 Dental volumetric tomographic (DVT) images showed multiple osteomas of the buccal cortex of the right mandibular angle and left mandibular angle (Figure 3,4). 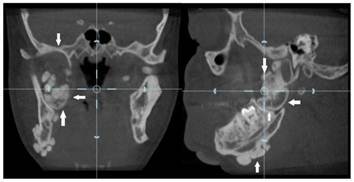 Additionally, in the coronal and sagittal sections of the mandible condyle, a huge osteoma that limited mouth opening was diagnosed (Figure 5). Cephalometrically, he showed a slightly retrusive maxilla with an ANB angle of 1˚and a relatively normal mandibula in anterioposterior direction. 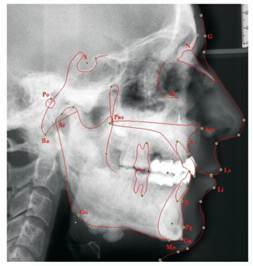 His mandibular plane angle (S-N / Go-Me: 25˚) and articular angle (S-Ar-Go: 133˚) were reduced (Table 1). His profile was straight due to the slightly retruded maxilla position. According to the Steiner's S line his lips were in normal position (Figure 6). The osteomas were submitted for pathologic examination. Histopathologic examination revealed that the specimens displayed a normal-appearing dense compact lamellar bone with minimal marrow spaces and rare irregular Haversian canals that did not show osteoclasts or osteoblasts (H&E X100)(Figure 7). Due to the dental anomalies, the osteomas in the mandible and the familial history of the patient, the patient was diagnosed as GS. Following resection of the osteomas that caused discomfort, prosthetic rehabilitation was performed. Tracing lateral cephalometric radiograph of the patient. Ricketts' analysis is illustrated. G = glabella; N = the anterior point of the intersection between the nasal and the frontal bones; Or = the lowest point of the inferior margin of the orbi; Pn = pronasale; Po = the midpoint of the upper contour of the external auditory canal; Pns = posterior nasal spine; Ans = anterior nasal spine; A = the innermost point on the contour of the premaxilla between anterior nasal spine and the incisor tooth; Pg = the most anterior point on the contour of the chin; Gn = the most anterior and inferior point on the mandibular symphysis; Me = the most inferior point on the mandibular symphsis; Go = the midpoint of the contour connecting the ramus and body of the mandible; Ba = the lowest point on the anterior margin of the foramen magnum, at the base of the clivus; Ar = the point of the intersection between the shadow of the zygomatic arch and posterior border of the mandibular ramus. Compact tissue within a loose connective tissue containing apposition and resorption lines(X100, H&E). 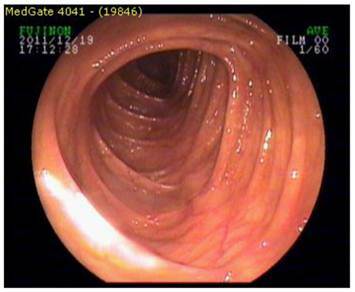 Endoscopic examination revealed an intact intestinal mucosa without any polyps. Gardner's syndrome is inherited as an autosomal dominant disorder with an incidence ranging between 1 in 4,000 and 1 in 12,000, depending on the region.5,9 GS is known to be caused by a gene mutation located at chromosome 5.10 The patient in this study displayed a familial history of the disease; the mother and sister had both died due to GS. Dental abnormalities are present in 30-75% and osteomas in 68-82% of GS patients. The osteotomas are generally located in the paranasal sinuses and mandible, display slow growth, and vary from a slight thickening to a large mass.13 Osteomas predominantly affect the mandible and maxilla5,12 but can additionally affect the skull and long bones. Calvarium osteomas, maxillary osteomas, and hypercementosis also occur.14 Osteomas are an essential component of GS, forming a slight thickening to a large mass that may affect all parts of the skeleton. The frontal bones are the most frequent osteoma site.6 Exosteoses osteomas, also called peripheral osteomas, and enosteoses osteomas can be palpable, and enostoses may be detected by routine radiography.3,6 In the mandible, two types of osteomas occur: central or lobulated. Centrally located osteomas are characteristically near the roots of the teeth, and lobulated types arise from the cortex and most commonly observed at the mandibular angle.6 We saw a huge lobulated osteoma at the right condyle and many central osteomas throught both maxilla and mandible. Our patient presented several dental abnormalities including multiple impacted teeth in the mandible and maxilla and osteomas throughout the mandible, maxilla, and both condyle and coronoid processes. Osteomas are predominantly detected by routine panoramic radiography.15 Pain is rarely observed, and the disease is predominantly asymptomatic, but the lesions can cause facial asymmetry as a result of expansion.13 In addition to clinical palpation, dental panoramic radiography is an effective means of detecting multiple osteomas of the jaws that are characteristic of GS. Radiologically, the lesions are radio-opaque. In our patient, radio-opacities on the angle of the mandible were observed, and several impacted teeth in all segments of the jaws were evident. Increased difficulty of tooth extraction was present due to the high density of the alveolar bone, the limited mouth opening, and the loss of the periodontal space.16 Our diagnosis was performed by CT radiographs to detect osteomas and dental anomalies.